Have you ever found yourself asking, “Is this all there is to life?” Or wondering if this bigger life you have created is actually a better life? And do you wonder how it all got so out of control? 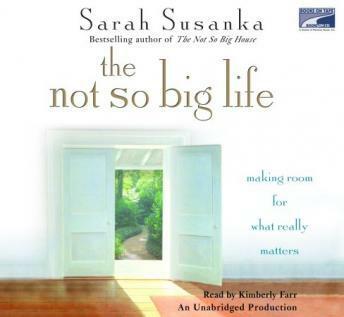 In her groundbreaking bestseller The Not So Big House, architect Sarah Susanka showed us a new way to inhabit our houses by creating homes that were better–not bigger. Now, in THE NOT SO BIG LIFE, Susanka takes her revolutionary philosophy to another dimension by showing us a new way to inhabit our lives. For many of us, our schedules are chaotic and overcommitted. Here, Susanka shows us that it is possible to take our finger off the fast-forward button. She reveals that form and function serve not only architectural aims but life goals as well. We quickly discover we have all the space and time we need for the things in our lives that really matter. But perhaps the greatest reward is the discovery that small changes can yield enormous results. In her elegant, clear style, Susanka convinces us that less truly is more–much more.